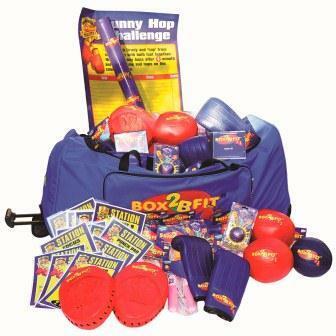 Box2Bfit is a fun new way of improving fitness levels, using training methods followed by boxers, without the contact. It was originally designed for older children but the fantastic feedback received led us to develop a primary version as well. The bag also includes an explanatory DVD which explains each station in detail, stationcards, so that everybody knows what they are doing on each station, and a record card on a pdf file which can be used to record repitions and improvement. This can either be a school workshop or outside school such as a club or leisure centre. We charge £380 + VAT for a one day's workshop. Normally these are within a school workshop enviroment and we spend the day at the school doing up to one hour workshops with classes of up to 60 children a time. These sessions can be used to motivate the students using an experienced box2Bfit instructor, so that they are keen to continue with the box2Bfit training sessions. The instructor can also train teachers and young leaders to lead the sessions themselves, either during school hours or after school. Schools do not have to buy a kitbag or have any equipment, as we will bring it along with us on the day. If the school wishes to carry on with box2Bfit themselves after the training day they can buy a kitbag. There are two types available the senior box2Bfit kitbag and the primary box2Bfit kitbag. Schools that also purchase a workshop will receive training on the day. We can be contacted on 01843 603020 or info@skip2bfit.com for more information or details of availability.